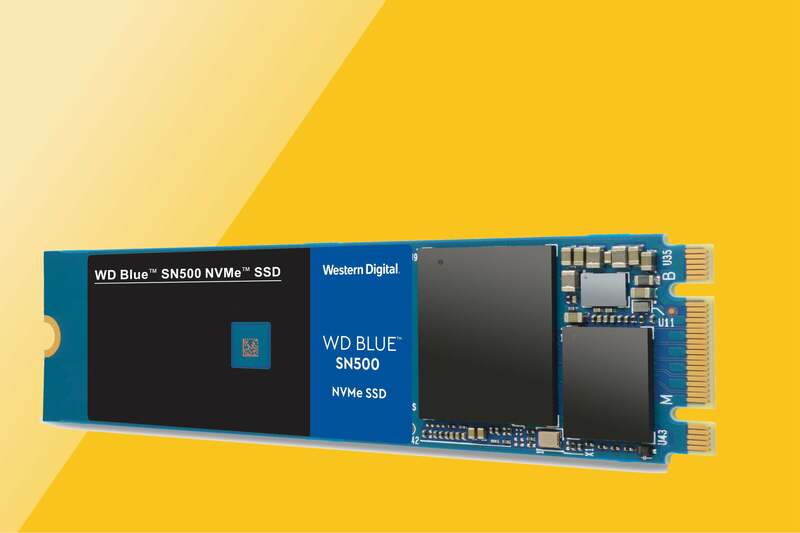 It doesn’t seem that long ago that the scoop was, “NVMe is great, but it’s gonna cost you big time.” Now, thanks to drives like WD’s new Blue SN500 (available on Amazon), price simply isn’t that big of an issue. At least not when you consider the 4X boost in speed it delivers. For most users, not having to wait for their computer anymore is worth a little extra cash. The Blue SN500 itself is a good performer that holds firm on long writes, unlike much of the similarly-priced competition. It’s certainly a kick in the pants compared to SATA. 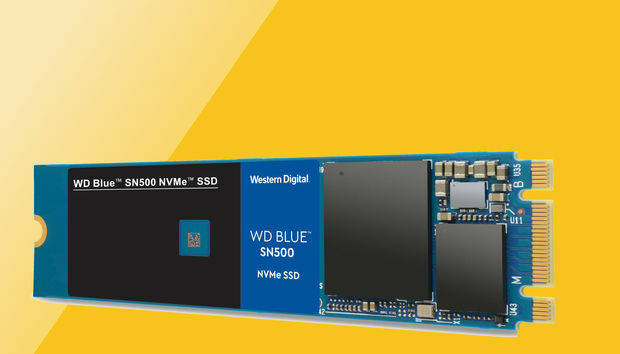 As with all NVMe drive for mainstream machines, the Blue SN500 uses the M.2 connector and is 22 millimeters wide. Also like the majority, it’s 80 millimeters long. You get the occasional shorty, such as Toshiba’s RC100, but 80mm is the norm. It’s PCIe 3.0 x2, which limits maximum throughput to 2GBps. We didn’t see quite that, but remembering that SATA is only about 550MBps, that’s still quite fast compared to what many are used to. The SN500 uses 64-layer TLC NAND, with some of that utilized as SLC cache. Roughly one percent (see the performance section.) There’s no DRAM cache, but the drive performs well without it. Note that there are a whole lot of legacy systems out there that don’t support booting from NVMe. You can employ NVMe SSDs using a $25 adapter card as super-fast secondary storage in nearly any system, which can be of benefit if you’re working with heavy-duty video or audio applications. But without the ability to boot from NVMe, you won’t get the overall system snappiness it’s capable of providing. The Blue SN500’s closest competitor in both price and performance is Crucial’s P1, which it beat in some tests, and lost in others. But keep in mind that all NVMe drives have ridiculously fast seek times, which makes the slowest of them seem fast in comparison to SATA, at least until you write large amounts of data. There, the 500GB version of the SN500 that I tested held its own. With less cache (some of the TLC is treated as SLC by writing only a single bit instead of three), the 250GB version (available on AmazonRemove non-product link), for which WD claims roughly the same performance, will drop in write speed sooner than the 500GB version. The 500GB model ran out of cache at about the 10GB mark during our 48GB write test. Note that I only included drives that are cost competitive with the Blue SN500. 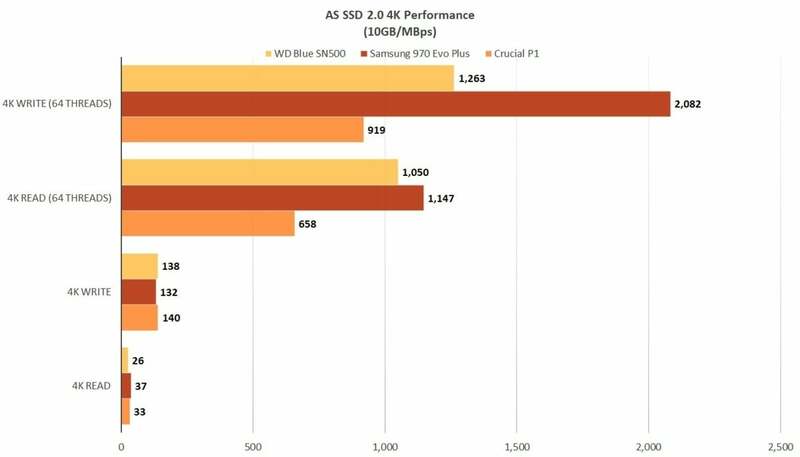 There are much faster drives out there such as WD’s Black SN750 NVMe and of course, Samsung’s 970 Pro, the creme de la creme. The Blue SN500 did quite well in the smaller file and folder tests, but lagged behind the Crucial P1 writing our single large 48GB file. As you can see above, the SN500 (gold bars) did quite well with smaller files and folders, but ran out of cache fairly early, dropping sustained write speeds to 750MBps. This resulted in a somewhat lethargic single file write time—for NVMe. 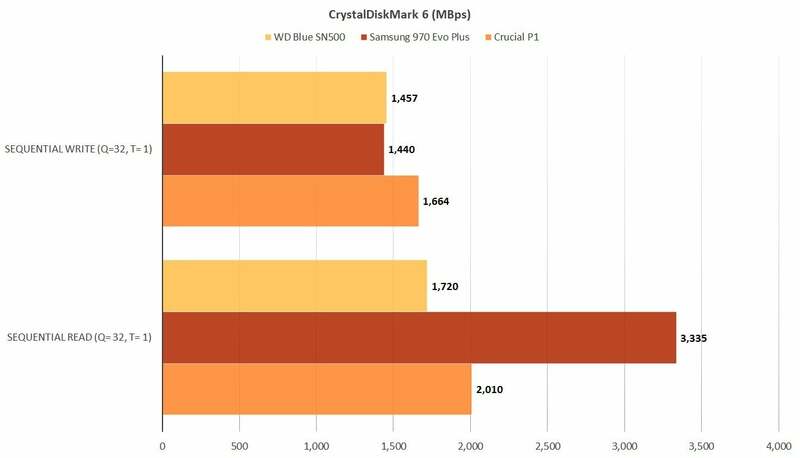 The SN500 did well in CrystalDiskMark, shown below, though it couldn’t match Samsung’s 970 EVO. Note that both competitors were 1TB drives with more cache. The 970 EVO slows down similarly once it runs out of SLC cache. 4K performance is indicative of how fast a drive can write or retrieve lots of small files, with requires lots of seeks and stresses the controller. 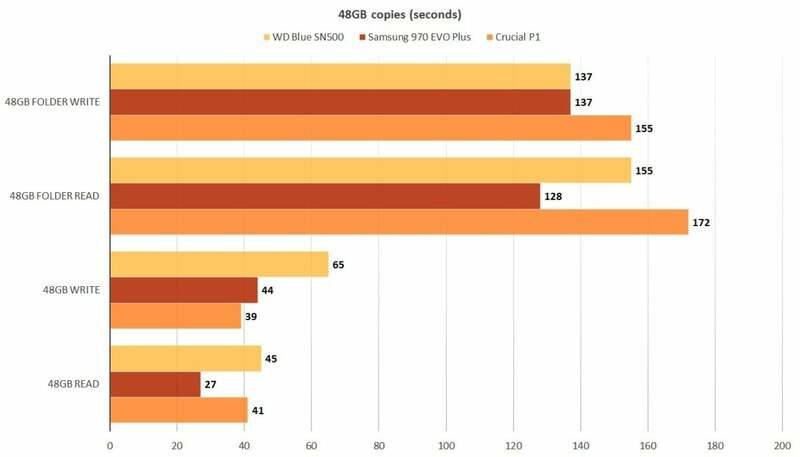 Here again the more expensive Samsung 970 EVO rules, though the Blue SN500 did quite well compared to other budget drives. The Blue SN500 isn’t the fastest NVMe drive out there, but it’s certainly fast enough for the average user, and the price is right. At the capacities it’s available in, I recommend it over the Crucial P1, which suffers a severe slowdown on those rare occasions when it runs out of cache. Hopefully, a 1TB model is in the works, as the limited capacity (by today’s standards) is the one thing that would keep me from installing a Blue SN500 in my own computers.